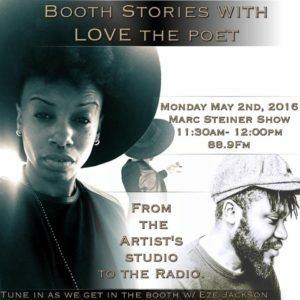 We hear the first part of a new series on arts & culture called Booth Stories, co-hosted by LOVE the Poet. We look at the impact the Baltimore Uprising had on arts and music in Baltimore, with Eze Jackson. Jackson is a rapper, activist and political organizer for Campaign for Justice, Safety, and Jobs, a coalition of over 30 Baltimore organizations focused on police reform, raising the minimum wage, and fighting against the proposed Port Covington project.